I'm not sure if this place has been completely demolished or not. But there was certainly no pub here any longer. All of the buildings here look new. We were recommended this pub for the onsite camping and the welcome in the pub. We were not disappointed. We were greeted at the door by two happy waggy dogs, one being Langley the pub dog. We ordered our drinks at the bar and were made so welcome didn't move from that spot all evening even eating our HUGE meal from barstools while chatting with the locals and other campers. We are already planning a return visit as it was such a great relaxing break with great value food and drinks, and the warmth of the reception was the icing on the cake. The food is very good and decently priced. Friday nights are for Fish and Chips large portions eat in or takeaway. Best beer Good Old boy well kept. The staff and locals are all very friendly as are the dogs in it. 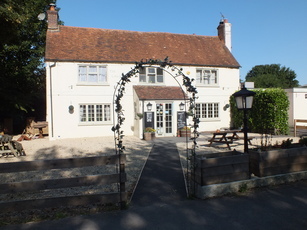 A lovely local pub with good food and service. We're not local but we've been in twice recently as a detour from the A34. The welcome has been very friendly from the staff and the locals. The menu is simple, but tasty. West Berks beer was good. We'll definitely be back as soon as we find an excuse to get on the A34. This is a pub, a proper pub. It's not a bistro, it's not an expensive restaurant. It's not trying to be anything clever. It's a pub, plain and simple. But it's a good pub. The food is simple, good, and locally-sourced. The beer is limited in choice, but who needs choice when it's well-kept West Berks Brewery on offer, and at a sensible price, too? The landlord and -lady are friendly, as are the chatty locals. Loveley warm stove in the bar end. Just the place to go for a chin-way, a pint and a bite to eat, and to boot the bill won't leave you cold at the end of the evening.